Hostels, one of the type of accomodation that offers budget-oriented room or even bed where guest can even share room. This type of accomodation is suitable for those who are travelling alone and not wanting to have a huge room to yourself, for those who really want to stroll around and only using the hostel for sleep and bath, as well as those who love socializing with others. For these types of sociable people, it might be better to choose hostel over the friendly budget hotels in Moscow for tourist. It can be a great choice for you to book an affordable hostels in Moscow, Russia, before flying all the way to Russia. Of course you’d want to enjoy your trip to the fullest yet still not spending too much money that are unecessary. That’s why, accomodation is also considered an important aspect of a trip. That’s where you’ll sleep and take shower, so choose wisely for your own convenient. If you’re a tourist wanting to stroll around Moscow for real, this hostel might be a good choice for you. It’s designed for business and fun trip. The location itself is strategic, as you can have easy access to the tourist attraction. It’s close to St. Basil Cathedral, Red Square where you can find famous landmarks in red square, Menshikov tower, Vincent Art Gallery, and Temple of the Great Theodore Stratilatus. There are 25 rooms with various types in Fasol Hostel. Beside the standard room, it also has Attic room, and dormitory. It’s nice and clean, as well as suitable for tourist who want a nice, comfortable place to stay in Basmanny. This hostel is only 4.1 km from the city center, which indicates that its strategic for tourist who are trying to explore the heart of Moscow. Although it’s quite simple and not too fancy, it’s clean, strategic, and has good service. There are only 15 rooms here, from double room, economy room, dormitory, as well as twin room. All those rooms are designed to cater to your need in a sophisticated way that you’d definitely enjoy. This hostel located strategically about 0.6 km away from the city center. It has 8 rooms, from family room, deluxe family room, Quadruple room which is the most popular choice there, superior quadruple room, as well as the superior room. The view that you’ll get is also not disappointing. Well, after all, what’s most important is that you can reach any tourist attractions nearby easily, right? That way you don’t have to waste so much time travelling from place to place and end up not having enough chance to visit all of the places you’ve desired to go to. As we can see through the name, this hostel has unique design and concept. Almost every room are designed as if you’re in the room under the roof. It’s artistic, comfy, and bringing you ‘home’ on your vacation. It’s also close to the city center with easy access to attractions. There are few types of room such as double standard room, dormitory, as well as luxury room. Have you ever dream of having a room on the roof? This hostel is trying to make ti come true, at least for few days of your stay in Moscow. Do you come to Russia for travelling or just business? This hostel cater your needs perfectly. It’s located near the city center, only 0.5 km away. It’s also unique with all of its room types. Double bed in dormitory, triple shared bathroom, double shared bathroom, double bed in dormitory, and so on. It’s convenient, also offers personal space for you to stay. Although it’s minimalist, you can spot a lot of black and white furniture there, but it’s softened by the brown furniture altogether. Enjoy your stay, vacation, or business trip by staying in a hostel that offer a whole package for you. From service, design, place, strategic spot, and of course, affordable price. Boxtel, you’ll be staying inside a box here. But of course, it’ll be a nice and new experience for you. It’s not just unique with its double capsule bed in dormitory room, it’s also comfortable to stay. City center is only about 1.7 km away from the hostel. It’s highly recommended for you who wanted to stay in an affordable hostels in Moscow, Russia, yet still get to bring back home new experiences. With nice service, convenient room, and strategic location, this hostel gives you the best experience. It has Twin room, standard double room, triple, VIP double bed, family room, and even suite room. This hostel also offers you lounge area. With it’s nice and fresh design, it ensures you feeling comfortable during your stay in Moscow. It’s colorful, so it can attracts children as well. Even if it’s not that kind of luxury hotel, it will still make you feel home with the fancy design that’s not too much yet not too plain as well. Standard, triple, quadruple, family, to superior family. Those are the types of rooms that you can choose from in Nereus Hostel. It has the choice of bunk or double bed. With its colorful design, it offers nice and comfy atmosphere for you to stay during your trip. While staying here, you can have an easy access to many tourist attractions in Moscow. All of the hotel room types, from the superior to family room offers seating area for guests. Another hostel in Basmanny that offers nice and comfy accommodations that’s not so far from the city center. Many tourist attractions are not out of reach, so it’s suitable for travellers who wanted to explore Moscow. It’s also designed simple yet convenient at once. Looking for affordable hostels in Moscow, Russia, is not a very hard task. But, it can be tricky if you don’t really pay attention. Where is it located, how big is the room, how much is the price, how far is it from the city center, and so much more question for you to ask. 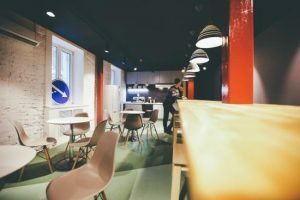 Oh, you might even need to check out whether the hostel you’re choosing is close to the most famous restaurant visited by tourist in Moscow, Russia or not. Good food in a country can’t be missed, right? Let the right guide leads you to an amazing vacation.